The Las Conchas Fire during the summer of 2011 was the largest in recorded history for the state of New Mexico, burning 634 square kilometers in the Jemez Mountains of north-central New Mexico. The burned landscape is now at risk of damage from postwildfire erosion, such as that caused by debris flows and flash floods. This report presents a preliminary hazard assessment of the debris-flow potential from 321 basins burned by the Las Conchas Fire. A pair of empirical hazard-assessment models developed using data from recently burned basins throughout the intermountain western United States was used to estimate the probability of debris-flow occurrence and volume of debris flows at the outlets of selected drainage basins within the burned area. The models incorporate measures of burn severity, topography, soils, and storm rainfall to estimate the probability and volume of debris flows following the fire. In response to a design storm of 28.0 millimeters of rain in 30 minutes (10-year recurrence interval), the probabilities of debris flows estimated for basins burned by the Las Conchas Fire were greater than 80 percent for two-thirds (67 percent) of the modeled basins. Basins with a high (greater than 80 percent) probability of debris-flow occurrence were concentrated in tributaries to Santa Clara and Rio del Oso Canyons in the northeastern part of the burned area; some steep areas in the Valles Caldera National Preserve, Los Alamos, and Guaje Canyons in the east-central part of the burned area; tributaries to Peralta, Colle, Bland, and Cochiti canyons in the southwestern part of the burned area; and tributaries to Frijoles, Alamo, and Capulin Canyons in the southeastern part of the burned area (within Bandelier National Monument). Estimated debris-flow volumes ranged from 400 cubic meters to greater than 72,000 cubic meters. The largest volumes (greater than 40,000 cubic meters) were estimated for basins in Santa Clara, Los Alamos, and Water Canyons, and for two basins at the northeast edge of the burned area tributary to Rio del Oso and Vallecitos Creek. The Combined Relative Debris-Flow Hazard Rankings identify the areas of highest probability of the largest debris flows. Basins with high Combined Relative Debris-Flow Hazard Rankings include upper Santa Clara Canyon in the northern section of the burn scar, and portions of Peralta, Colle, Bland, Cochiti, Capulin, Alamo, and Frijoles Canyons in the southern section of the burn scar. Three basins with high Combined Relative Debris-Flow Hazard Rankings also occur in areas upstream from the city of Los Alamos—the city is home to and surrounded by numerous technical sites for the Los Alamos National Laboratory. Potential debris flows in the burned area could affect the water supply for Santa Clara Pueblo and several recreational lakes, as well as recreational and archeological resources in Bandelier National Monument. Debris flows could damage bridges and culverts along State Highway 501 and other roadways. Additional assessment is necessary to determine if the estimated volume of material is sufficient to travel into areas downstream from the modeled basins along the valley floors, where they could affect human life, property, agriculture, and infrastructure in those areas. Additionally, further investigation is needed to assess the potential for debris flows to affect structures at or downstream from basin outlets and to increase the threat of flooding downstream by damaging or blocking flood mitigation structures. The maps presented here may be used to prioritize areas where erosion mitigation or other protective measures may be necessary within a 2- to 3-year window of vulnerability following the Las Conchas Fire. 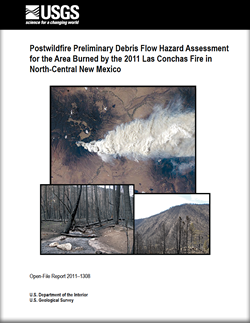 Tillery, A.C., Darr, M.J., Cannon, S.H., and Michael, J.A., 2011, Postwildfire preliminary debris flow hazard assessment for the area burned by the 2011 Las Conchas Fire in north-central New Mexico: U.S. Geological Survey Open-File Report 2011–1308, 11 p.